They found the house Saleh's father had likened to heaven. It was now occupied by a Jewish family, who, Saleh said, refused to let them inside. 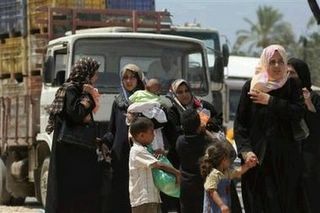 Upon their return to Balata, Saleh's father gathered his children around him. "You remember the house? It's our house," he said, holding up a rusty object Saleh had never seen before. "I have the key." Read more. 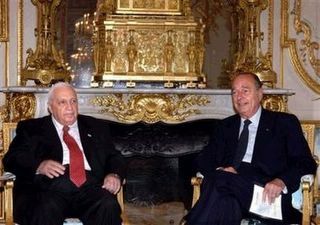 Ariel Sharon, prolific, prodigious killer of Arabs, receives a cordial reception from morally deficient western leaders. For some of Sharon's latest handiwork, see pictures of the latest Palestinian kids he's maimed and slaughtered just this week. Closure at Abu Holi in Gaza. 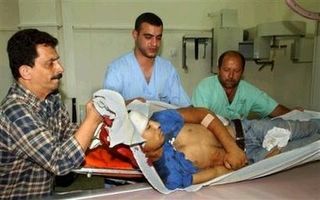 Yousuf Hasses before he was shot through the head by the vicious Israeli Colonisation Enforcing Army. Notice the lack of body armor. Closure in Abu Holi in Gaza. Abu Holi closure. 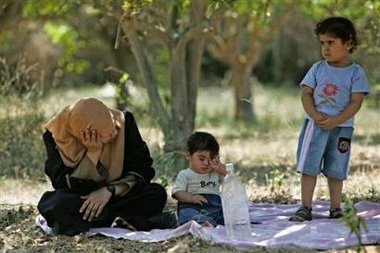 This mother and children are a bit luckier than Laila El-Haddad who wrote in an op-ed in the Washington Post that her sixteen month old son almost fainted from hours of waiting in an unairconditioned bus at the Rafah checkpoint. 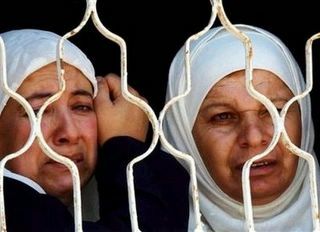 These women are mourning the death of Yousuf Hasses of Zbouba, near Jenin. 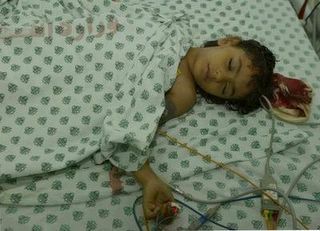 Yousuf had the courage to throw rocks at the criminal Israeli military machine. 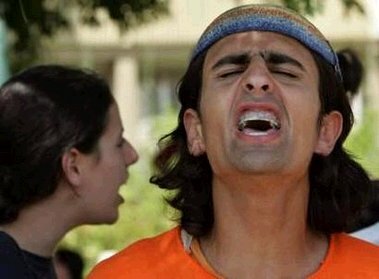 This raging Gaza colonist sings for colonisation; he sings for apartheid; he sings for ethnic cleansing; he sings for Jewish supremacy; he sings for extrajudicial assasinations; he sings for shooting kids through the head; he sings for uprooting olive trees; he sings for razing zoos; he sings for racism; he sings for house demolitions; he sings for separation roads; he sings for hogging water; he sings for greed; he sings for inhumanity; he sings his song of relentless, unabashed evil. Yousuf Hasses, another Palestinian kid shot through the head for courageously throwing stones against vicious colonizing usurpers who think that they have a God given right to other people's lands. "We try to use new methods of resistance and try to carry the message to regular Israelis to show them that we don't hate them. I am a Palestinian who does not hate human beings, only oppression and occupation." "So while disengagement will bring some relief for Gazans it is by no means the end of the Israeli occupation. In June, my son and I spent 10 hours at Rafah Crossing--Gaza's only route to the outside world--waiting for Israeli approval to return home from Egypt. We waited, crammed with 80 others like sardines in a tin, in a bus without air conditioning in the scorching June heat, as the air thinned and my son nearly fainted." Those of us living in Western Europe are safe now knowing that the British police have received training in Israel. My half-Arabic, half-Filipino teenage son is usually quite calm so no danger that he'll display any nervousness riding public transportation while carrying a backpack. Fidgeting just might get him killed by a nervous policeman. Who knows? Brown eyed boys living in Britain may be victims of a "break-the-bones" policy, the favorite of Yitzak Rabin during the first intifadeh. If that's too antiquated, there is always the penchant the apartheid state has for shooting kids through the head and heart. Will the British be soon to emulate this particularly garish policy of the "light unto the nations."? Here's what Massoud Shadjareh, of the Islamic Human Rights Commission says: "When British police officers receive training from forces of an apartheid state which uses assasination as an official policy, killings such as this (Menezes's) can only be expected as a natural consequence." Read more about the training of British police in Israel in Al-Jazeera. Here is a link to a gushing story about a Jasper family, and below is the courageous and indomitable Annie Annab's response to their fantasy (not like a Disneyland fantasy because Jewish fantasies turn in to nightmares for Palestinians). The Japsper dad is a shill for what's called Aliyah, which is some manufactured notion that all Jews have a right to kick the indigenous people off the land because the Jewish God is a real estate agent and he promised the land to the Jews. The American daddy Japser works in an Israeli PR firm selling Jews on the idea of emigrating from the US. None of these colonizing Jews seem to have a conscience when it comes to the indigenous Palestinians whom they're so blithely displacing. I ban Zionists from my blog (which means I don't get too many comments) because I don't grant them a forum for their obfuscations. There are NOT two narratives. There is one narrative. The Zionists shoot kids through the head and heart; the Zionists destroyed four hundred plus villages in 1948 and then committed cultural genocide by coming up with names for the five thousand year old names; the Zionists have destroyed culture; they dynamited the Kahlil Sahknini cultural center in Ramallah (just one paltry example of their destruction of Palestinian history and culture); the Zionists kill leaders, writers, popular people; the Zionists with the backing of the US and the western powers have waged a slow genocide against the indigenous Palestinians. So don't even think about obfuscating, misleading, prevaricating, or dissembling on my blog. This venue is closed. It is a tad ironic to read your editorial "A needed U.S. presence" alongside the great letter by Lisa Snyder complaining about American Jews immigrating to Israel with their children in order to live in an illegal settlement on the far side of the green line.Snyder's letter was in response to the very long article published in the Sun on July 17 concerning the Jasper family of Baltimore who recently left America (where they still have full and equal rights) to take advantage of Israel's Jews-only immigration policies and Israel's many other Jews-only privileges and perks : Meanwhile the Palestinians, the native non-Jewish population of the Holy land, have no real rights anywhere. Palestinian children suffer and starve in crowded refugee camps while American Jews get handsome bribes and subsidizes to help create a Jews-only state. And we the American people are footing this monstrous bill and making this blatant injustice and insult to the Palestinians possible.Ultimately what our "friend" racist Israel really needs is much less U.S. weaponry, money, sympathy and support. Nino was one of the most popular residents of a refugee camp in Nablus. Israel killing him shows that they control everything and everyone . . . a sad, but illluminating story from Electronic Intifada. Published at http://www.palestinereport.org on July 20, 2005. On July 14, Palestinian security forces opened fire at a group Hamas members on their way back from firing mortars at the southern Israeli town of Sderot.The mortars had been launched, according to Hamas, in reaction toIsraeli incursions into the West Bank on July 13 and 14 that had lefttwo dead - one a Palestinian Authority police man in Tulkarm and one an Islamic Jihad leader in Nablus - seriously wounded a second policeman and saw the arrests of a dozen members of Islamic Jihad and Hamas. TheIsraeli incursions came after a suicide bombing in Netanya, claimed byIslamic Jihad, killed five Israelis.The PA acted after one the mortar attacks on July 14 - one claimed bythe Fateh-affiliated Aqsa Martyrs Brigades, however, and not Hamas -killed an Israeli woman. Five Hamas members were wounded in theconfrontation, and Hamas immediately made clear it would not refrainfrom responding. Later that night, Hamas members attacked the headquarters of the national security services in Gaza City, and on July15, a gunfight between PA forces and Hamas members in the Zeitoun neighborhood of Gaza City, resulted in the killing of two teenage bystanders and injuries to dozens on either side. Hamas rebuffed the PAforces and set fire to an armored personnel car.To muddy matters further, the Israeli army revived its assassination policy and killed seven Hamas fighters, in addition to bombing numerouslocations in Gaza. Israeli Prime Minister Ariel Sharon on July 16 threatened a full-scale invasion of the Strip and amassed troops on theborders of the Strip. On July 19, after several further skirmishes and injuries, leaders ofHamas and PA officials announced they had reached an agreement, after days-long Egyptian mediation, to end hostilities, but early on July 20 clashes continued, even if they were quickly quelled. Relations between Hamas and the PA have not been this fraught in years. No one expected the tension between Hamas and the PA to reach such acritical point so quickly. In the past few years, mutual conflict has been limited to recriminatory statements. It is not completely surprising though either. Hamas has accused Fateh,the dominant party in the PA, of delaying PLC elections purposefully until it has a better popular standing. For its part, the PA has consistently warned Hamas and others against taking the law into their own hands and endangering the five-month-old truce President Mahmoud Abbas agreed with Sharon in February and subsequently with the factions in Cairo in March. Analysts and observers have been cautioning against confrontation, but it seems the "red line" that everyone warned about was crossed.Throughout the tensions, both the PA and Hamas repeatedly stressed that neither party was interested in civil war. Hamas released a statement saying that "what happened in Gaza is not a war on the PA, nor is it an attempt to put it out of power". On behalf of the PA, Prime MinisterAhmad Qrei' said, "We are not in competition with anyone. ... But if we don't increase our efforts to empower the PA then there is no place for it and the alternative is the Israeli occupation". In the July 13 story on the suicide bombing in Israel, which killed three Israelis, you include information about Israeli deaths going back to 2001. Nowhere is there mention that Palestinians have also been killed during this period - in far greater numbers. In fact, in the current intifada about 250 Palestinians were killed before a single suicide bombing occurred in Israel. Most recently, since the truce was declared on Feb. 25, approximately 40 Palestinians have been killed by Israeli forces, and 400 were injured. Although it is important to report on Israeli deaths, your readers need to learn the whole story - not one half of it. I spent much of today talking to Palestinians trying to cross the Netzarim checkpoint today. It is basically a 6m deep trench dug deep into Gaza's coastal road, which has in recent days been ripped apart by nocturnal armoured bulldozers that come out from behind the lone sniper in he distance, and dissappear before dawn when their work is done.The checkpoint, along with one further south at Abo Holi, has divided Gaza into three isolated segments for over five days now: Rafah and Khan Yunis in the south; dair al-Balah, Maghazi, and Nseirat refugee camps in the central Gaza Strip; and Gaza city, Beit Hanun, and Jabaliya in the north.It was a painful site, as I heard testimony after testimony of the hardship endured in what would otherwise be a daily routine. Commerical trucks, donkey carts, fruit vendors, taxis, all attempting to make it down the trench and across to the other side. Young women heading to college carrying textbooks, walking over 3 km around the checkpoint; Women with infants; Elderly Palestinians trudging across on canes through mounds of sand; And most heartbreaking of a all, a man who was suffering from Parkinson's, and had come back from al-Shifa hospital with a bag full of medicine and a medical transfer to Egypt, though he would be unable to travel there because further south, Abo Holi checkpoint was completey sealed off to commuters.I heard accounts of "close-calls", of bullets just missing commuters heads, fired in "warning" by the lone sniper overlooking the checkpoint, and when it was over, I headed home, relieved that none of those bullets had been fatal, satisfied with a job well-done, and wrote the story out.I made it home in time to meet with a colleague from the BBC (and former boss of mine at Aljazeera) who was here on assigment for a radio program. "I just heard a 14-year-old boy was shot at Abo Holi, but the IDF hasn't yet confirmed it," she said.I checked my sources. I called the hospitals, the families in Dair al-Balah, and sure enough, 14-year old Raghed al-Masri was brutally killed, as he was waiting with his family in a taxi at Abo Holi.But the world's media was too busy covering a press conference Abbas was holding, and a meeting between Hamas and Egyptian delegates on the "ceasefire." I immediately called an Israeil Army spokesperson for an explanation. THey dodged my phone calls, and finally, late in the night, they called me back, only to tell me the matter was "under investigation". 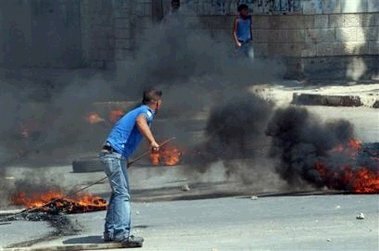 "All we know is that Palestinian cars attempted cross the checkpoint by force, so the soldiers fired warning shots into the air, not at the cars, and we have not received word of any injuries-there wasn't even an ambulance there. "Suddenly, all I could think about was Tom Hurndall. And Rachel. Iman al-Hams. Norran Deeb. And her mother's tears. and her father's silent anguish. And the lies. the terrible lies.The doctor who examined Ragheb's body said the bullet hit him in the back and came out through his chest, tearing his fragile heart apart. There is no chance this bullet was fired into "open air".Now I think to myself as I head to bed, having just submited a news story on the tragic incident, after rewriting my initial story that merely talked about the closure's impact (how could I know the impact would be so deadly? ), I feel a sense of emptiness inside.I compiled the facts and snapped he photos and wrote them out, nicely arranged, on a page, on a site, that soon, will be forgotten. Along with Ragheb. Along with all the innocent angels that have fallen. And I think to myself, when will it end? The "light unto the nations" spreads its sunshine. After a few months of cautious hope, blood, fire, and fear has become the norm again in Gaza. Back to counting the dead, counting the injured, phoning the medics to try to learn the names of the casualties. For the Palestinian civilians, it is back to sleepless nights trying to judge how close the shooting and bombing is, or trying to sleep at closed Israeli checkpoints.Where did it start this time? Should we go back to the suicide bombing this week in Netanya? The Israeli Army has been routinely arresting members of militant factions and staging incursions into areas under Palestinian control despite the supposed cease-fire. The young militant who carried out the Netanya bombing said he was "responding" to the Israeli crimes in the West Bank. Of course, IOF activity only increased after the Netanya attack on the 12th, while in Gaza, the militant factions increased their Qassam launches in—yes, that word again—"response." Thursday night, an Israeli woman, Dana Glakowitz, 22 who lived in a town near the Gaza border, was killed by a Qassam strike as she sat on the porch of her home. The Palestinian Interior Minister declared a state of emergency and ordered the PA police to stop the militants from firing on Israeli settlements and towns hear the border. 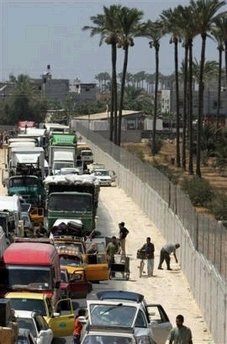 The IOF immediately closed the checkpoints, dividing Gaza into three sealed sections and shortly after midnight launched four rocket strikes on Gaza within an hour. Three were in northern Gaza, one on a cemetery in Khan Younis that the Israeli military claims is being used as a launch site by the militants. In Gaza City the headquarters of an Islamic charity was destroyed—the IOF claimed it was "pro-Hamas. "There were heavy clashes all night between PA police and masked militants, with cars carrying Hamas members attacked and, in retaliation, militant attacks on police stations and police cars. Tragically, in the Zeytoun neighborhood of Gaza City, two bystanders, a teenager and a child, were killed during a firefight between militants and the PA police.With the dawn, the police-militant conflict largely ceased, but civilians were burning tires in an effort to blind the Israeli unmanned surveillance drones. In mid-afternoon, the Israeli helicopters resumed extrajudicial assassinations by rocket attacks an hour apart on two cars carrying Hamas members—one near Nablus, and one in Gaza City. In the Gaza City airstrike around 4pm, four Hamas members were killed, their white Volkswagen reduced to barely-recognizable rubble, and six pedestrians were also injured. Eyewitnesses said body parts and shredded flesh of the four passengers were scattered over a wide area. Witnesses report Israeli troops and tanks are massing at the sealed borders. Former Navy Lieutenant Harvey Tharp of Iraq Veterans Against the War spoke publicly for the first time on July 4 during a lunchtime break of the National Education Association's Representative Assembly. His talk was sponsored by the NEA's Peace and Justice Caucus. Tharp was honorably discharged from the Navy in March 2005. Six months after the invasion of Iraq, Tharp, along with five others was, in Tharp's words, raided from the Navy Staff Corps. Tharp was called upon because he had studied Arabic five years earlier. Although Colin Powell had spent five million dollars on a study for how to operate in post war Iraq the study was nixed and the neo-conservatives wouldn't send experienced Arabic speakers or diplomats to Iraq. Tharp says that when he showed up in Baghdad his co-workers said, "Wow, we have people to send out." Tharp, armed with 180,000 dollars in reconstruction for a population of one million was sent to Kirkuk. When asked how he could communicate with Baghdad, he was told to sign up for a hotmail account. As for security he was armed with an AK-47 and provided a security briefing. Having no body armor, Tharp sent off to bulletproofme.com to acquire his own. When he asked who his CO was, he was told, "We're working on it." Kirkuk wasn't as important as the Oil Ministry, which had the South African Army and Halliburton to provide security as well as an unlimited budget. The Navy was unable to rob Tharp of his humanity. Working with Iraqis he was impressed by their manners and decency. When he heard about Abu Ghraib, he thought to himself that he was glad that he was no longer in Iraq because he didn't think that he could face the Iraqis who worked for him. "This was not Animal House," he said about Abu Ghraib. He quoted the British Major General who said that Americans treated Iraqis as if they were untermenschen and remarked, "American society doesn't care about lives of people overseas." The lies perpetuated by the Bush administration are mere "window dressing for the ultimate reasons we're in Iraq." Reasons cited by Tharp include oil, protecting allies, and control of the world. Tharp, faced with another tour in Iraq, which would require him to direct combat, felt certain that "having met those people changed my perspective [and I knew that] I could not voluntarily nor involuntarily kill them." Luckily for Tharp, the Navy had a surplus of lieutenants and he was able to resign; unfortunately this is not the case for enlisted personnel. "I am going to do everything I can to end this war as soon as possible," Tharp says. "The one thing that we can do is to keep them from getting fresh mortar bait." His mission now is to caution children that to join the Army or Marine Corps right now is a "bad idea." For teachers, it is important to understand that the "weak point of the military machine" is in the recruiting. Harvey Tharp is the first person in the US Military whom I have encountered who acknowledges the humanity of the Iraqis and who has not been brainwashed regarding the reasons we are there. Muheeb Ahmad Assi, 15, was among those struck by a bullet. He was pronounced dead at the scene. According to another reporter at the scene, Laila El-Haddad, “Palestinians were not allowed near the teen until over an hour had passed, by which point Assi had bled to death.” The youth was the son of the village’s leader of the Popular Committee Against the Wall (PCAW). JOIN US FOR OUR FIRST NATIONAL CONVENTION IN CHICAGO!Just before the AFL-CIO convenes in Chicago, its delegates will havea rare opportunity to learn about Palestinian and Middle Eastern labor rights and unionizing efforts, as well as American unionists' efforts to support them. This conference will also examine the history of the relationship of the AFL-CIO to Israel as well as theextensive investments of AFL-CIO pension funds into Israel Bonds. One of our featured speakers will be *Atef Saad, Director of theMedia and Information Department for the Palestine General Federationof Trade Unions. Other speakers include participants in American labor delegations to the West Bank, as well as unionists whom AFL-CIO unions have tried to silence when they have taken public stands indefense of Palestinian rights. The conference will also debut a new film by Alternate Focus on the contradictory relationship betweenU.S. labor and Israel. Labor For Palestine is a growing nationwide network that aims tochange the AFL-CIO's policy toward Israel; disinvest union pension funds from Israel Bonds; organize labor delegations to OccupiedPalestine; and increase education and awareness on fundamental laborand human rights. We invite labor activists, trade unionists and union locals to endorse and participate in this critical conference. For additionalinformation on the conference such as registration, directions,background information and other items please visit the conference website at http://www.laborforpalestine.org, send an email toinfo@..., or call 312-491-9092. Co-Sponsored by (list in formation): New York City Labor Against theWar, Palestine Solidarity Group-Chicago; Not In My Name; Al-Awda, ThePalestine Right to Return Coalition, Students for Social Justice, UICS tudents for Justice in Palestine, DePaul Students for Justice in Palestine. Fernando Suarez del Solar spoke to a roomful of teachers on July 5 at the National Education Association's annual Representative Assembly. Fernando, whose son Jesus died when he stepped on a cluster bomb challenged us when he questioned, "What happened to you teachers?" Fernando belongs to Military Families Speak Out, and has founded a counter-recruitment organization, Proyecto Guerrero Azteca. Jesus' story is one that high school children must hear. Fernando owned a business in Tijuana when Jesus decided in 2001 that he wanted to join the US Marines in order to combat narcotics traffickers. Fernando, who is a Mexican citizen, as was his son, sold his business in Tijuana so that his son could follow his dream. When Jesus finished boot camp in 2001, he told his father that he didn't want any member of his family to join the Marines. Recruiters didn't tell him that he would have to pay for his uniforms, that he would have to pay for his life insurance, and that the lauded education benefit also came with a price, one hundred dollars monthly. In fact the military couldn't be bothered with paying for all of Jesus' funeral. The most difficult news for Jesus was that one must be a US citizen in order to join the Federal Agents in pursuit of drug dealers. Jesus told Fernando that he intended to serve his four years and leave. In February 2003 Jesus found himself in Iraq. He told his father not to worry about him, that he wanted to help the children. Fernando's son did not return from Iraq. Jesus, who was not a trained scout, was ordered to perform as a scout on March 27. On March 26, the US forces had unloaded 20,000 cluster bombs in "homes, hospitals, and schools," according to Fernando. When Jesus was working as a scout, he did not receive any information that there were cluster bombs in the area. Fernando was informed by the military that Jesus died in combat by a shot through the head. Later he found out that this was a lie; that his son died in a "friendly fire" incident when he stepped on a cluster bomb. "My life changed," Fernando told us in halting English. In December 2003 he visited the place where Jesus died. He also visited children in hospitals and talked movingly about the beautiful babies who died within three days because there was no medicine to treat their diarrhea. Fernando made a promise to help these children and in December 2004 along with other parents who lost soldiers in the war delivered 600,000 dollars worth of medicine. Fernando is on a mission to keep the military recruiters out of high schools. To that end he has spoken in 155 high schools in sixty-five cities. He admonished the teachers in his audience to "help for [his] grandson's generation. [The] best way to combat terrorism is the book. Stop the next war, " he challenges us. "Stop Criminal Recruiting." Kids who think that they are going to get money for school via the military must be apprised of other options and certainly not depend on a military that is merely an extension of a corrupt government. The place for kids is the university, not a military base, says Fernando. Fernando concluded his presentation by reminding teachers that it is "our work [to teach] justice, tolerance, and peace for other people." On July 5, Nadia McCaffery of GoldStar Families for Peace spoke before delegates to the National Education Association's Representative Assembly. According to the flyer disseminated by the NEA's Peace and Justice Caucus, "Nadia is the mother of Sergeant Patrick McCaffrey who was killed in Iraq on June 22, 2004. Gold Star Families for Peace is a group of families of soldiers who have died as a result of war. They have organized to be a positive force in our world, to bring our country's sons and daughters home from Iraq, to minimize the human cost of this war, adn to support other families who have lost their sons and daughters to war." Nadia said that her son was thirty-four and the father of three kids. He was killed in an ambush. After 9/11 he said, "I have to do something," and joined the National Guard. Told that he'd be deployed to Utah, Nadia's only child was sent to Iraq instead. According to Nadia, "He left with a great big smile in broad daylight." He came "back at midnight." The US government wanted to avoid media but Nadia "called [the] media to welcome him." She says "I am proud of my son and not about to hide him." Nadia said that it took Patrick about a week to understand the lie. "I don't know why we're here," he relayed to his mother. "There is no water. There is no electricity." Nadia admonishes us to say "No to War, No to Killing. Who is going to raise my grandchildren?" she poignantly cried. "What did Viet Nam accomplish? Algeria?" "Speak out! Do not be silent! Silence is our worst enemy. Speak out loud!" Nadia, who grew up in France in the aftermath of WWII says, "I say 'No' to War, especially this one. Please think. Who have we become? We need to react. We need to stop hating and discriminating." While she was in Amman she met a young child who stood up and said, "I want all the Americans to leave and go home." When Nadia asked him what he would do if they didn't leave, he replied, "Then I will kill you all." If he wasn't successful? "Then I will go to your country and kill you all there." The current war, concluded Nadia, is "robbing us of tomorrow." "The NEA calls on President Bush to support our troops by creating an exit strategy and bring our troops home. "provide adequate veterans benefits and meet the needs of our veterans for adequate jobs, education and healthcare. "support NEA members and their families called upon to serve in Iraq by identifying and providing information about resources and services to help meet their special needs, by advocating for their interest and by protecting their jobs, seniority, and benefits. "advocate the reordering of national priorities toward peace and the human needs of our people." "end the U.S. Military Occupation of Iraq and bring our troops home." The adoption of the amended resolution (the substitution of "exit strategy" for "end the U.S. Military Occupation") by the majority of the delegates was considered a great success by members of the NEA Peace and Justice Caucus, who moved the new business item. Members of Peace and Justice also moved or supported items related to violation of student privacy re military recruiting, CAFTA, and Haiti and sponsored panels including Medea Benjamin of Code Pink, and GoldStar Families, an organization of anti-war parents who lost children in Iraq. condition for the provision of support to the Palestinian health sector. including the right to choose partners from within and outside Israel. military occupation and work towards bringing about its end. such actions may well end up perpetuating today's realities. suffering of Palestinian and Israeli patients. those who should know better. people like you that we can forge new beginnings and reach new horizons. once more, unwavering commitment to reconciliation and genuine peace." siege (such as the Jenin Hospital during the IDF incursion ).